After another long re-trial, a jury found Pedro Hernandez guilty of kidnapping and killing Etan Patz over three decades ago. 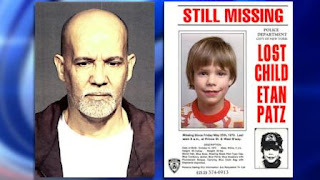 Etan Patz disappeared on May 25, 1979 after walking to take his school bus at the stop just blocks from his home in SoHo, Manhattan (see: www.sacerdotus.com/2012/05/etan-patz.html). Pedro Hernandez had confessed to luring the boy to the basement of a store he worked at as a teenager. There, he said he strangled and crushed the young boy's neck killing him. Afterwards, he claimed to have thrown the boy's body in the garbage. To date, the remains have not been found. Hernandez suffers from mental illness. His attorney argues that he was coerced to give the confession and will say anything. He is planning to appeal.